Not only is Gegard “The Dreamcatcher” Mousasi the new Strikeforce lightheavyweight, he is Fedor Emelianenkos sparring partner and they like to spar. The even showed so with an exhibtion match and M1 Globals most recent event Breakthrough. Check it out………. Isn’t it beautiful? Although this little exhibition match was a hit, Mousasi also took a hit when he injured his shoulder and was forced to pull out of his next bout with Sokodjou at DREAM 11. 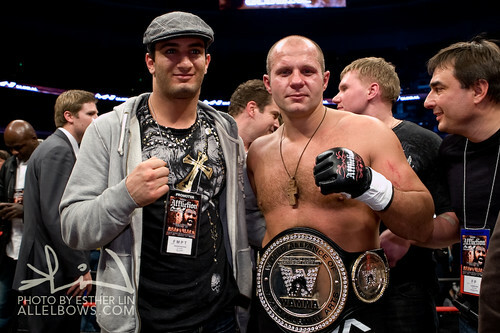 It’s a shame because I was looking foreward to more of Fedor’s apprentice bc unlike Fedor, Mousasi has the strive to be on top of the MMA world.